Tulsi Tea (Holy Basil Tea) is rich in antioxidants and natural phytochemicals, which are water-soluble and infuse into the tea during preparation. Mainly Tulsi Tea supports immune system, respiratory system, digestive system and nervous system. It has antimicrobial and immunomodulatory properties, which help prevent common cold, recurrent infections, flu, productive cough and bronchitis. It is also an appetite and digestive stimulant. Therefore, Holy Basil Tea helps in improving the appetite, digestion and overall metabolism in the body. It also has calming effect and stress relieving effect on the brain, so it is helpful for people with stress disorders, depression and anxiety. The antioxidant action of Tulsi tea protects against cancer and other diseases by scavenging free radicals. About: Tulsi (Holy Basil) is the most sacred herb in India and named “Queen of the herbs”. It is also known as Holy Basil. It is found in southern part of Asia like Thailand, India and Hindu influenced countries. Hindu has been worshipping the Tulsi herb morning and evening since the past 5000 years. Due to its effective benefits, it is not known in India, but also known in all over the world. The meaning of the word Tulsi is “the incomparable Plant”. Tulsi is the Sanskrit name of the Holy Basil plant. The scientific name of the Tulsi herb is Ocimum Tenuiflorum (Ocimum Sanctum). Its leaves are harvested and dried to form organic Tulsi Tea. Here we look at the different Tulsi Tea Recipes. Generally, Tulsi Tea can have three variants. Take water in a tea pan and add 2 tbsp. Chopped Tulsi Leaves. Boil the water with Chopped Tulsi Leaves for 5 to 10 minutes. Strain the Tulsi Tea and serve it hot. Serve warm and add honey or sugar as per taste. Strain and add refrigerate it. Add honey or sugar as per taste and serve cold. Normal tea powder ½ tsp. Mix Tulsi leaves, normal tea powder, sugar (but not honey, if it is used in place of sugar), ginger slices in water and boil for 10 to 15 minutes. If you want to add honey in Tulsi Tea, then let it become warm and then mix honey as per your taste. Additives: You can also add coriander seeds, anise seeds, lemon grass, and cardamom powder while boiling. Tulsi tea helps to enhance the immune system. It helps in expelling out the phlegm from throat. The immunomodulatory, anti-inflammatory and expectorant properties of the Tulsi tea provide relief from the common cold, cough and other respiratory issues like bronchitis and asthma. Tulsi tea also contains CAMPHENE, EUGENOL, and CINEOLE that help in relieving the congestion. This herbal tea is full of antifungal, anti-microbial, anti-inflammatory and antibacterial properties, which help the body in fighting with infections and allergies of respiratory tract. Tulsi is a rich source of magnesium, which is good for the health of the heart. The magnesium helps the blood vessels to proper work. However, magnesium content in Tulsi tea is insignificant, but still it prevents the collection of the cholesterol and helps in free flow of the blood. It reduces the risks of having atherosclerosis. The antioxidants present in Tulsi Tea prevent the heart from free radical damage. Regular intake of Tulsi tea helps to reduce cholesterol levels and lower blood pressure. Tulsi tea is very helpful in mild fever conditions because it has anti-microbial, antibacterial and mild antipyretic properties. Fever itself is not a disease. It is actually a result of infections caused by microbes, virus or bacteria. Tulsi tea treats the infection caused by the microbes and lowers the temperature or fever. So, Tulsi tea helps in the recovery of the infectious fevers like upper respiratory infections, malaria, dengue etc. Tulsi tea is helpful in maintaining the levels of cortisol hormones (stress hormones) in the body. High levels of cortisol make you more stressed. Therefore, Tulsi tea makes you stress free by lowering cortisol levels. It is a natural anti-stress agent, which also helps in soothing the nerves of the nervous system. As it has anti-microbial properties, the Tulsi tea helps in fighting with germs and bacteria in the mouth. It helps the patients with pyorrhea, mouth ulcers and oral cancer. It prevents bad smell and acts as good mouth freshener. As Tulsi tea is full of antioxidants and phytochemicals, it is beneficial in maintaining the healthy skin. As the age of a person increases, the body’s ability to fight with free radicals decreases and skin issues starts appearing. By taking Tulsi tea one can get ability to fight with free radicals in the body and make your skin healthy by delaying the signs of aging. Apart from that, this tea helps in reducing the itchiness of the skin of the head and cures hair condition. Today, headaches are very common due to stress, long hectic schedule or improper sleep. These are always frustrating or painful. It makes you mentally exhausted. A cup of Tulsi tea can make your senses rejuvenate and relax. If you want to lose your weight with a healthy and natural way, then Tulsi tea is the perfect product. Tulsi tea is effective and safe for losing weight. With this tea, your body will burn more and more fats by increasing the metabolism of in the body. Tulsi tea helps the individuals who are suffering from the constipation with mucus content. It helps to improve the overall functioning of the liver, bowels and the bladder. It has strong anti-spasmodic effects, which are helpful in painful constipation. It also helps in assimilation of lipids, carbohydrates and proteins. Tulsi tea is a diuretic that help to flush more impurities from your Kidneys and increase urination. It reduces the uric acid levels from the body. By removing the impurities, this tea helps in breaking down the stones in the kidneys. It also helps in reducing the pain due to kidney stones. Drinking Tulsi tea without adding sugar has given a positive feedback to diabetic patients. It lowers the blood sugar levels in the blood. 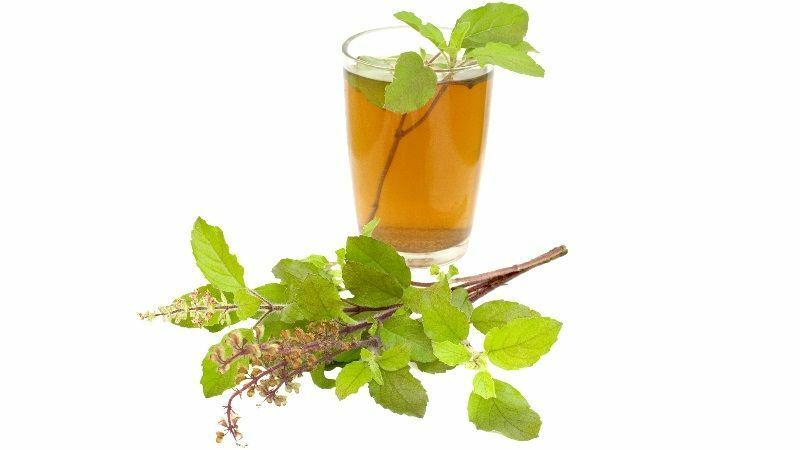 Tulsi Tea may also prevent diabetes in healthy individuals keeping healthy functions of pancreas and preventing insulin resistance. Tulsi tea contains anti-carcinogenic and anti-oxidant properties. These properties help to kill free radicals in the body and can prevent pre-cancerous cells from growing. Taking Tulsi tea daily reduces the risk of having cancer in various parts of body. It is very hard to quit smoking. But if anybody wants to quit this bad habit from heart, he should drink one cup of tea in replace with each time of smoking. Most of the people do smoking because of stress. Tulsi tea has anti-stress compounds that help in quitting smoking. Tulsi tea contains anti-inflammatory and anti-oxidant properties that helps in reducing the pain and inflammation associated with the joint disorders. It also helps in reducing the swelling near joints and tissues. Tulsi Tea is LIKELY SAFE and beneficial for most individuals. The over consumption of Ginger Tulsi Tea can cause heartburn, hyperacidity and burning sensation in the abdomen. However, these effects are not reported with simple Tulsi Tea (Tulsi Tea Recipe-1). Tulsi grown in polluted areas is not safe for the human beings. It may contain chromium and other toxins. These toxins can damage liver and kidneys. Therefore, you should purchase the organic Tulsi tea from the market or you can grow Tulsi herb in the healthy soil at your home or garden. Do not use if you are allergic to Tulsi (Holy Basil). Excessive amount of Tulsi may cause contractions and menstruation. Specifically women in first trimester should avoid using of it. There is not particular information about the breastfeeding moms, but stay on the safe side. Do not use it. Tulsi tea is not recommended for the babies younger than two years. Use of Tulsi tea has blood-thinning properties. So, if you are planning a surgery of any body parts, then avoid using of Tulsi tea at least three weeks before a scheduled surgery. Is Tulsi tea good to drink before bedtime? I have trouble sleeping and don’t want to drink if it will give me more energy? Tulsi also has anti-depressant and anti-anxiety properties and due to these properties, it also acts as soporific (sleep-inducing) agent. Therefore, Tulsi tea will also help to improve sleep and reduces the mental exhaustion and stress. is tulsi original tea safe to drink during my colonoscopy prep? There should be no problem taking Holy Basil Tea.